An active partition or a computer boot partition stores startup files of the operating system. The active partition in Windows system is usually named with letter C.
When you turn on the computer, the operating system on active partition creates an image that gives the primary partition and logical partitions some specific letters, whether F or G.
The primary partition will be assigned the first letter, let’s say F and then the logical partition will be assigned the next letter, for instance, letter G.
When you have more than two partitions and both an operating system installed, you can set an active partition as you want. You can set your active partition for Windows that will load the operating system when you switch on the computer. This kind of systems are called dual-boot or multi-boot system. You should set the active partition only if you have installed an operating system on it, else your computer will never work. That being said, there are some important things you need to know when it comes to setting up the active partition as mentioned below. You cannot set a logical drive or extended partition as active. You can only set the primary partition as active. A physical hard drive only accommodates one active partition. You may set several active partitions if you have several physical hard drives on your computer. But the only active partition that will be detected by the BIOS is the one on the first hard drive. The active partition must be bootable. The bootloader and boot files for the operating system must be saved on the active partition. The operating system used must be contained in the primary partition since that’s the first spot it will look when the computer boots. The bootloader will be executed first by the boot sector, and then the bootloader will look for the operating system boot files. This is how the OS will start up your computer. 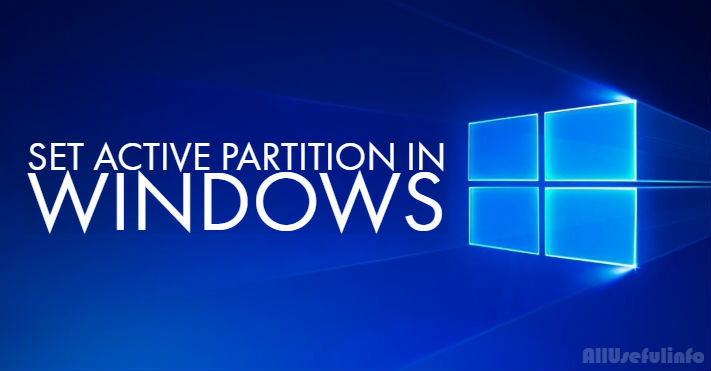 Let’s get started with these 4 easiest methods to set active partition in your Windows computer carefully. Always keep the above mentioned things in mind before trying any of the below mentioned methods to set active partition. The first method you can use to set active partition is MSCONFIG. However, this method will be effective on primary partitions set on the same hard drive, so if you have multiple drives, MSCONFIG will not be able to detect them. Go to the START button and enter MSCONFIG on the search section. The tab that opens contains the operating system and the active partition contains Current OS; Default OS next to the name of the operating system. Click on the OS and then select Set as default. Sometimes your computer may fail to boot after you’ve marked the wrong partition as active. When such a situation happens and you are unable to set active partition in Windows, the command line becomes helpful. Different versions of Windows have different ways to access the command line. Here how you can access the command line and remember to press enter after every line. A command prompt will open, type list disk. You will see a list of all the disks in your computer then type select disk n where “n”is the disk you want to set active. That’s how to set active on the latest Windows computer. You can access the Disk Management via the Control Panel. Another way to access the Disk Management is to right-click on Computer and choose Manage. You will see Disk Management. Right click the primary partition which you want to set active then select Mark Part as Active. Press WIN+R to access the RUN box and then type diskmgmt.msc. Right-click on the partition to set active and select Mark partition as active. The last but not the least method to set active partition is by use of Partition Software IM-Magic Partition Resizer. This is an all-in-one partition software you can use to resize disk partition without interfering with the data saved in it. The good thing about this software is that it supports FAT and NTFS partition. It’s easy to use the software since you just download it, run it and you are done. Apart from these methods, you can still use other methods to set active partition such as the Linux CD; however, this method is sometimes complicated. Note that, you may lose the partition and its data during the process if you do it incorrectly. In this case, you will need to do active partition recovery. This method will perform file recovery as well.